Resilient seated butterfly valve, uses the flexibility of rubber seat, could easily achieve zero leakge, therefore is a widely applied valve in oilfield, agriculture, water & waste water and mining industries. Due to its rubber lined body materials, it is usually used in low pressure lines. 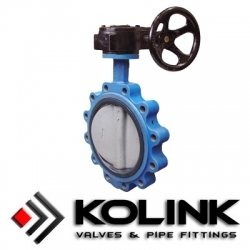 Lug type butterfly valves have threaded inserts at both sides of the valve body. This allows them to be installed into a system using two sets of bolts and nuts. 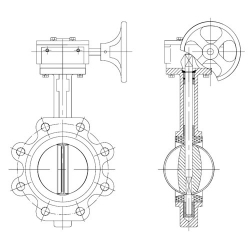 The valve is installed between two flanges using a separate set of bolts for each flange. This setup permits either side of the piping system to be disconnected without disturbing the other side. A lug type butterfly valve used in dead end service generally has a reduced pressure rating. For example a lug type butterfly valve mounted between two flanges has a 150 psi pressure rating. The same valve mounted with one flange, in dead end service, has a 75 psi rating. Materials of Valve Body: GG25, A126 B, GGG40, A536, WCB, LCB, CF8, CF3, CF8M, CF3M, etc.